Does Sun Power RV have a blog site? — Sun Power RV - Go Power solar panels, inverter kits, battery sales and installation for RV, motorhome, and yacht. Can I power my refrigerator with solar? Do you have a video explaining Sun Power RV solar products? What is solar energy? Solar Definitions. What is a battery isolator, diode, or solinoid? Does Sun Power RV have a blog site? BLUE MIND - The Science Behind the Stoke! 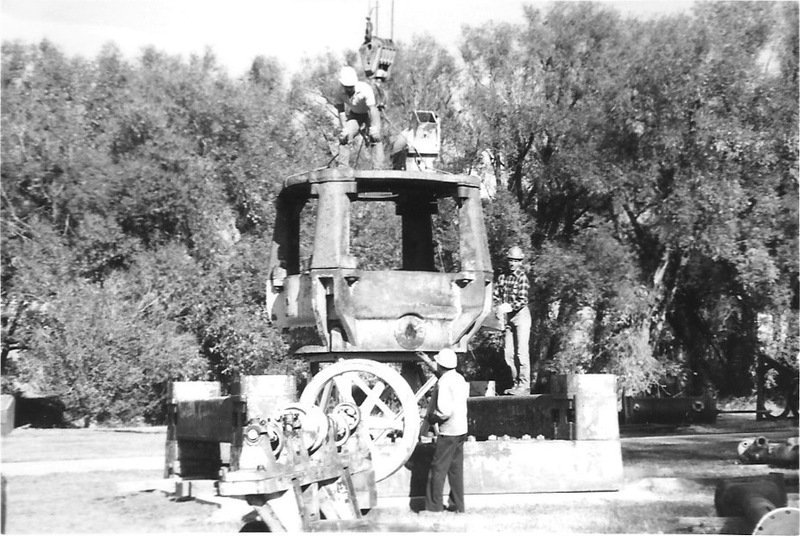 Mining Engineer, Tom Hathaway, is put in charge of assembling a 1900 vintage steam stamp at the Western Museum of Mining and Industry in Colorado Springs (circa 1986.) The Nordberg Steam Stamp came from Chicago's Museum of Science and Industry. It was my job to design and build the foundation and assemble the 90 tons of cast iron. Most of the bolts used doubled as bar bells. There were no plans to follow and most of the pieces had partially sunk into the red clay of the front range. This type of line drawing served as my blue print. I became proficient at bending and tying steel. Hickie bars really help..
We calculated the mortar at 30 tons. The crane had to choke up for this pick. The four legs supporting the piston base all tilt inward. Only four blots keep them from falling until the base is set. Setting the fist steam cylinder. Getting ready to set the second cylinder on this "steeple compound stamp." The local paper came out for the final piece. I had to reach under this cylinder to align the piston rod. I always requested the same crane operator so we had built a good rapport. This is how the steam stamp looks today. Specifications and prices are subject to change. You will be contacted if Price, Tax or Shipping changes prior to processing your order. © 2018 www.sunpowerrv.com, Sun Power RV, Solar Home and RV, SHRV, SPRV, All Rights Reserved.